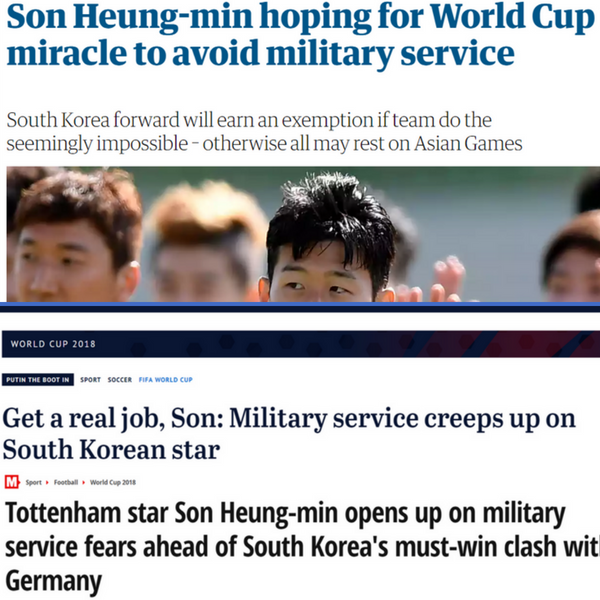 International media outlets have directed their attention on star forward Son Heung-min’s potential military enlistment. Foreign media is showing interest in Son Heung-min’s (26) military enlistment. At the moment, the star forward is a vital part of Korea’s national team’s offensive strategy at the 2018 World Cup in Russia. Nonetheless, Son, who was born in 1992, is approaching the maximum age (28) for military postponement. Once he reaches 28, he will not be allowed to travel overseas or put off his service for any other reason. Under the Military Service Act, Son is a candidate for a grade four social service worker. A Spanish newspaper had an article titled “Son Heung-min will miss two years of his soccer career to serve in the military,” and went on to say that Korean law regarding service is stringent. Moreover, other international outlets like Mirror and The Guardian, both based in the U.K., have also published articles on the subject. Son has spent the majority of his professional career in Europe is arguably the most recognizable South Korean around the world. Although Son has two more years until he needs to enter the army, the focus on the player’s situation stems from the current World Cup. If the national team wins the tournament, they may have a shot at getting a full military exemption. Which in turn, means they won’t have to worry about having a two-year hiatus, which may be detrimental to their careers. The precedence for this originates to the 1992 World Cup when the then national team reach the semi-finals. Olympians with gold medals and winners of the Asian Games are also exempted. Taking into consideration that Korea has already lost three out of the four matches that have in this World Cup, the chances are low that the team will reach the coveted semi-finals. Additionally, as The Guardian notes the “South Korean public have become increasingly intolerant of the “rich and famous using their status to delay or avoid” military service while most men don’t have a choice. As such, with the current situation, dire Son can only hope that his team performs well in the upcoming Asian Games. Meanwhile, South Korea goes against Germany on June 27 at 7 am PST. South Korea’s national team beat Germany 2-0 in stoppage time, but are still heading home from the World Cup.